With news of a rapidly increasing population and the constant search for new food sources, particularly protein, to meet popular demand; it’s perhaps unsurprising that (disregarding unpleasant connotations) insects have become such a popular dietary addition. It’s estimated that over two billion people, worldwide, consume bugs as part of their daily diet, while in a BBC interview earlier this year Hollywood Actress Angelina Jolie revealed that she and her children regularly enjoy eating insects. Once we’re able to overcome the “yuck factor” – a term coined by the Waste and Resources Action Programme – insects are not only an environmentally sustainable food, they’re also highly nutritious. Back in 2013, two friends Shami Radia and Neil Whippey formed Eat Grub, encouraging people to embrace insects as a food source. In his marketing work with international charities, Shami travelled to many countries around the world including Malawi, where he saw a whole community’s excitement at roasting and eating flying termites as well as how great they could taste. Neil’s interest in exploring new foods, on the other hand, was kindled by a diagnosis of Crohn’s Disease at the age of 19. An incurable inflammatory bowel condition that’s often met with public unawareness and generally calls for a selective, enriched diet, amongst other lifestyle changes. Edible insects are thus potentially brilliant news for sufferers, thanks to the abundance of nutrients they contain, coupled with their low levels of complex fats. Over the past four years, the pair have brought a number of edible insect products to the market, including the likes of roasted crickets, edible mealworms, grasshoppers and buffalo worms, as well as having published a cookbook (Eat Grub: The Ultimate Insect Cookbook) last year with recipes created by Seb Holmes – renowned for his take on Thai street food. Continuing this partnership, Eat Grub will team up with Seb Holmes again at the end of this month, hosting a pioneering pop-up restaurant in north London, showcasing the potential of cooking and eating insects. Launching on Sunday 28th May, in Highbury, the Eat Grub pop-up will take place on the last Sunday of each month, until September. This follows the success of previous pop-up restaurants held in 2014, in Hoxton and London Fields, also showcasing dishes created by Seb Holmes. Championing insects – deemed as the original superfood – for their nutritious benefits, particularly protein, the new series of pop-ups will see Seb and the Eat Grub team prepare a selection of new Thai-inspired insect dishes, plus a handful from the Eat Grub cookbook, using the Eat Grub insect produce farmed especially for human consumption. Each diner will be served a selection of tasting dishes, ideal for sharing, and a dessert. 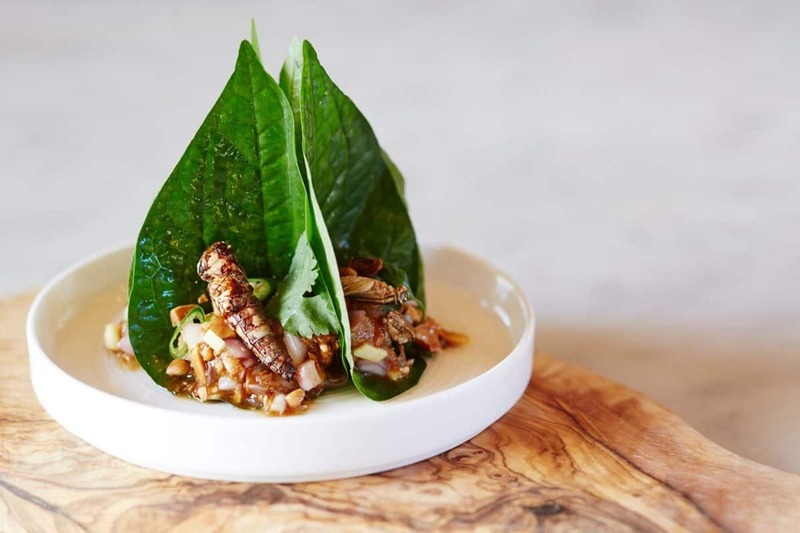 The menu is still subject to change, but guests may expect the likes of Insect Miang (containing soy crickets and worms with flavours of coconut, ginger, chilli and betel leaves), or salted cricket and smoked tomato Som Tam salad. In addition, Bermondsey brewery Fourpure, the event’s drinks sponsor, will provide beer alongside bespoke cocktails from Strongman’s Tipple mixologist Tomas Lenko, also favouring insects throughout his recipes. Bookings for the Eat Grub pop-up are open. Reservations can be made by e-mailing book@eatgrub.co.uk with a time request and table size. The restaurant will seat diners between 6:30pm and 9pm. Seb’s five course menu will cost £33, including a Fourpure beer or glass of wine. Further information can be found at eatgrub.co.uk.